Mission Motors launches the world's fastest electric superbike to be made available to speed-freaks in 2010, with the 'Mission One' bike entering the Isle of Man TTXGP this summer. The Mission One was designed by Yves Béhar's fuseproject – already well know for his work with the Aliph Jawbone, BMW Mini and 'One Laptop Per Child'. This eco-friendly bike boasts a top speed of 150mph with an estimated range of 150 miles on a full charge, made possible by a proprietary high energy lithium-ion battery pack. "Mission One also boasts adjustable throttle maps, adjustable regenerative braking and ride data acquisition which can be wirelessly linked to a computer," adds the press release. 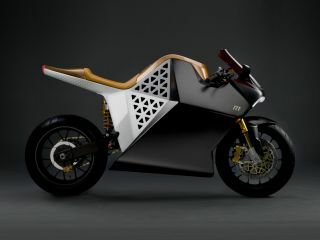 "The TTXGP is the perfect platform for us to show how far electric bike innovation has come and to express what Mission Motors is all about," according to Forrest North, CEO of Mission Motors. "That's why we've chosen this event to debut our Mission One motorcycle and prove that speed, endurance and performance can all be achieved in a sustainable way… With the Mission One, we're writing the next chapter in motorcycle design, delivering a new riding experience without sacrificing performance or design in a zero emissions vehicle." On the back of the TTXGP, Mission Motors hopes to sell 50 limited edition Mission One bikes, with upgraded equipment, for delivery in 2010, followed by 250 lower-spec Mission One bikes in the same year.